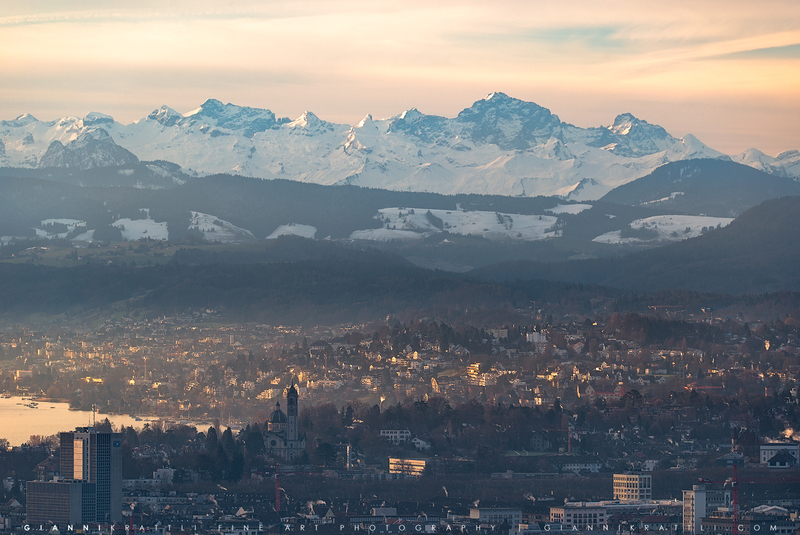 The panorama of the city of Zurich from Mount Uetliberg on a wonderful morning in autumn. 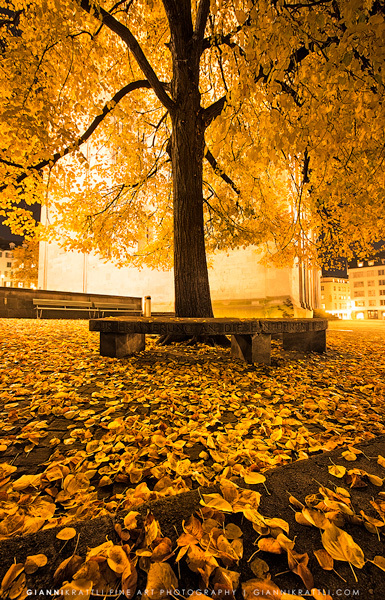 The Autumn turns the city of Zurich in a magical dress. This bench in front of the church Grossmünster in the oldtown was one of those special places. For this moment I had to wait for years. 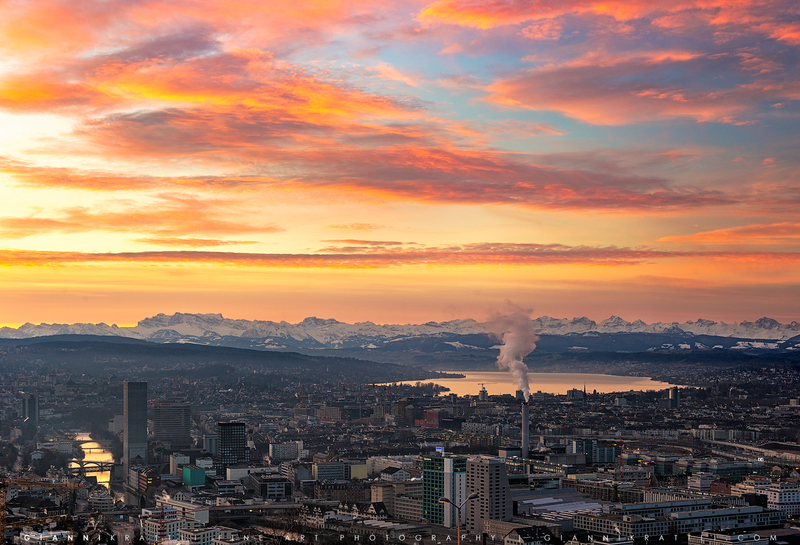 A breathtaking sunrise above Zurich with the Swiss Alps in the background. 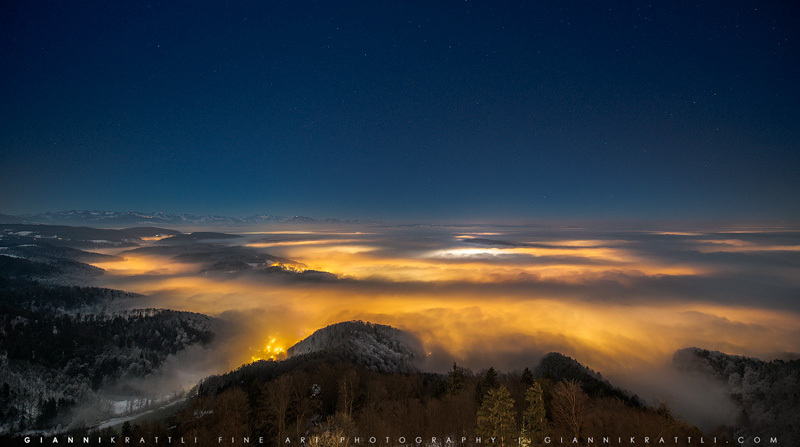 That there is clear air even above the biggest city in Switzerland is just delightful. This sunset at the tram station Central was on my to do list for a long time. The construction was finished and the weather looked promising. First the clouds got thicker and thicker and a short rain shower moved across the city. But in the right moment the sun punched through the clouds. It was just for a minute but the scenery was perfect. 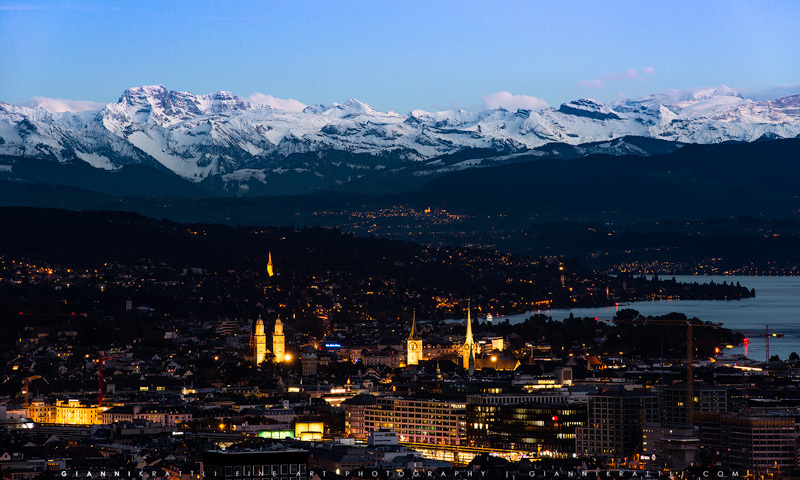 Zurich, for me one of the most beautiful cities in the world. During the day some clouds were moving in heading west. At sunset the clouds above the Hotel Dolder Grand looked like fire in the sky, the red color was so intense! I was standing there with big eyes and enjoyed the jaw dropping atmosphere. 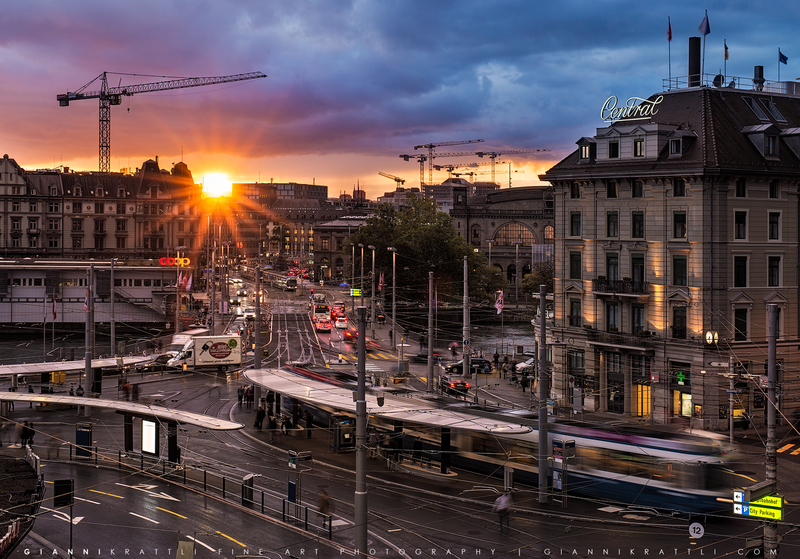 A so beautiful sunset I hadn’t seen above the city of Zurich for a long time. 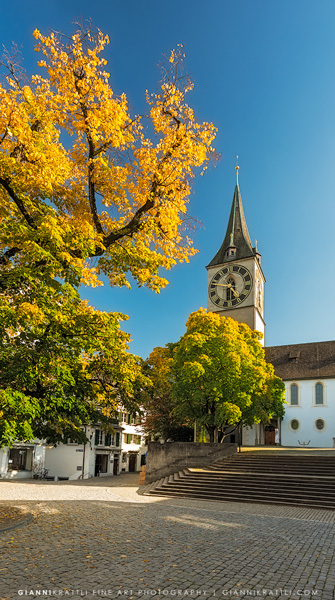 The Church Enge at the foot of the Swiss Alps when the sun was rising above the city of Zurich. 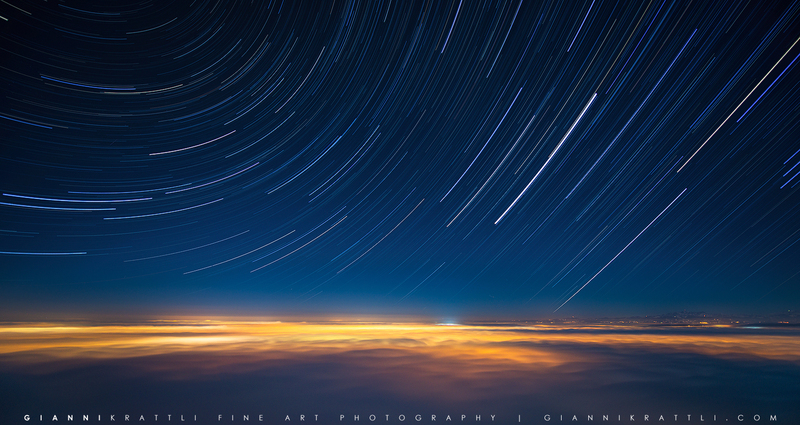 Star trails above the fog covered city of Zurich. Everyone knows the stunning pictures from Dubai with its skyscrapers in the fog. 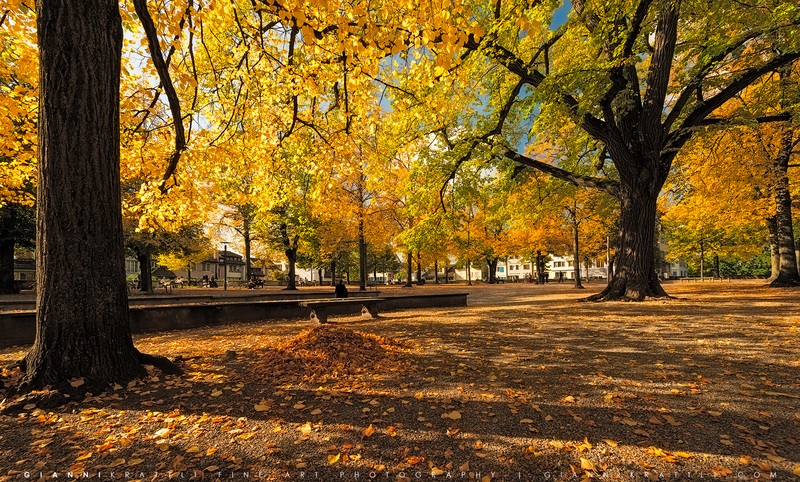 Well, in Zurich it looks like this. The tallest building of Switzerland is called Prime Tower in Zurich and measures 126m in height. Not really high compared to other metropolitan cities. In Switzerland we have other things which scrape the sky like the Alpes in the background (Gross Windgällen 3187m, Chli Windgällen 2985m, Bristenstock 3073m). This picture has been taken from the Waid at 600m in January at -5°C. It shows the city of Zurich 30min before sunrise covered with a thin layer of fog. 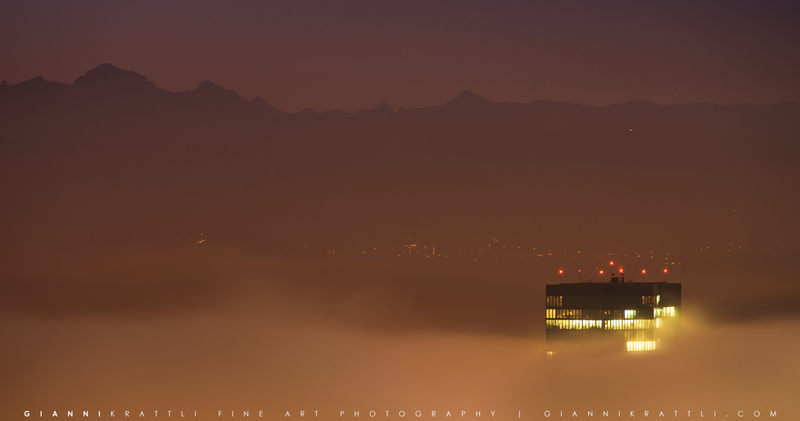 This view is rare because usually the fog reaches much higher. 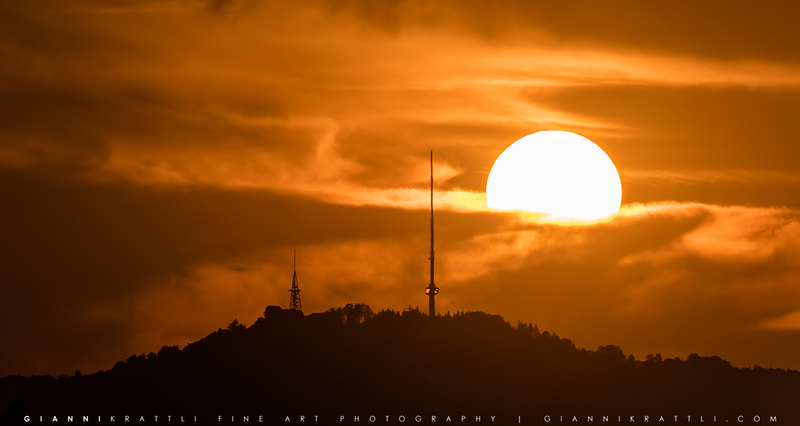 The sun was setting behind Mount Uetliberg and it looked like the clouds were on fire. A sunny autumn day is going to end above the Albis mountain chain. 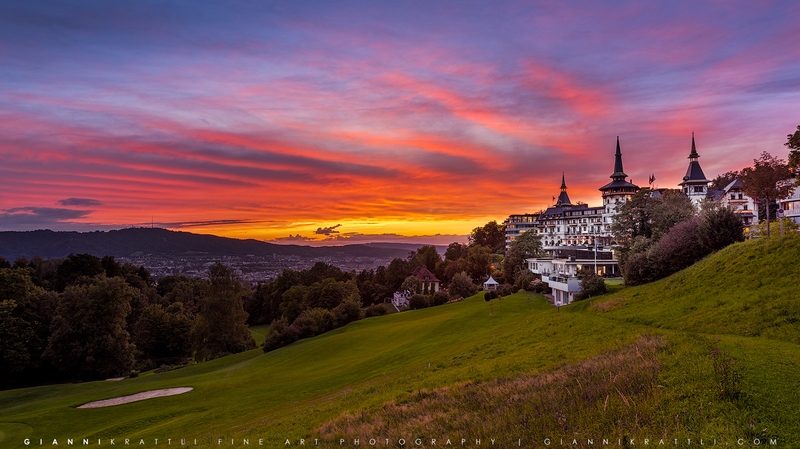 A wonderful sunset in September at the Dolder Grand hotel. Sometimes it is worth a closer look towards the setting sun. Due to the zoom lens the sun appeared very big and the sky seemed to be burning. Nevertheless finding a good composition at 400mm is not very easy because the sun is moving fast and is typically very bright. 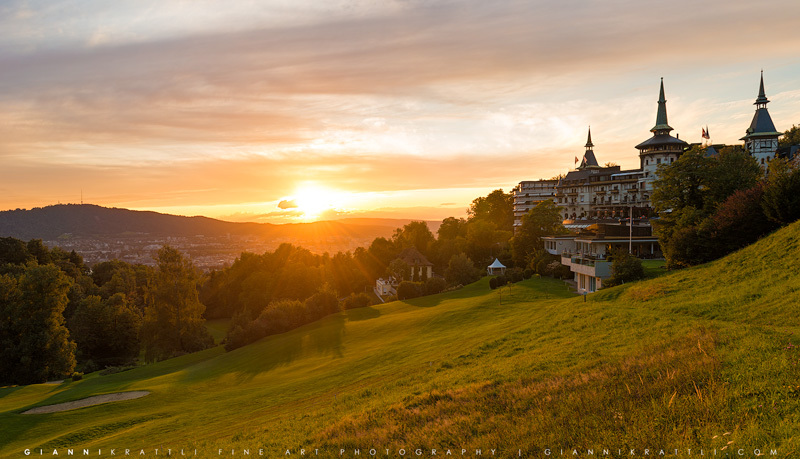 This photo has been taken at the Lake of Zurich at the Chinawiese Park looking towards the city center. 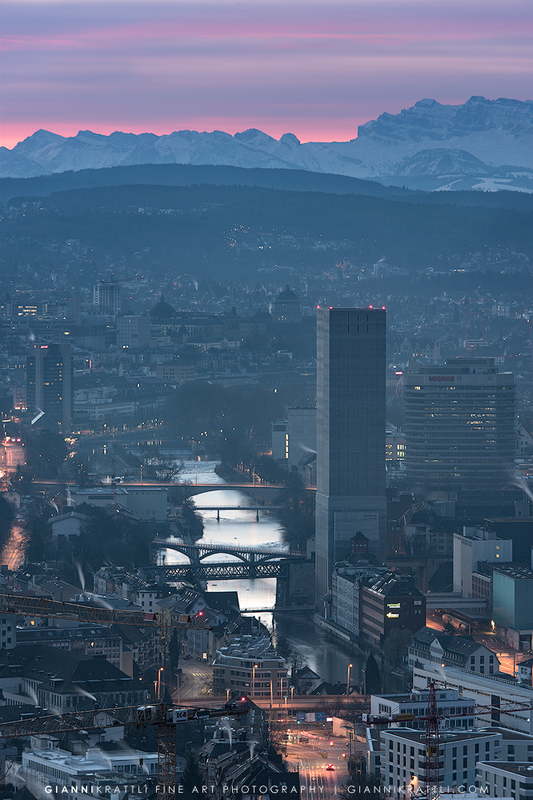 The height of the buildings in the city of Zurich will never reach the Swiss Alps. In this picture you can see one of the tallest building of Switzerland. It is the Swissmill Tower with 118m in height. On a foggy morning at -5°C I was out shooting the moon with my 70-200mm lens plus 2x extender. I captured this photo just before sunrise on a frozen field above Zurich at the Waid 600m therefore the slight red glow. 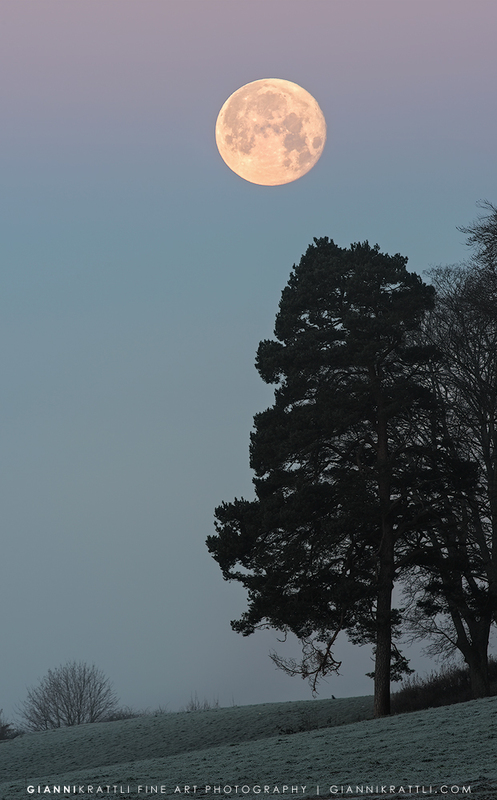 A couple of minutes later the moon disappeared and the fog got thicker. I was very lucky to get this shot because it wasn’t planed at all. 30 minutes before sunrise I arrived in Zurich with the train after a weekend in Central Switzerland. The sky was cloudy but in the distant east I could see some clear sky. When I checked the different webcams I was pretty sure there would be color in the sky at sunrise. A couple of minutes later at the Burkliplatz I was able to the the sunrise with a 8 vertical shots panorama. According to the planning tool the full moon was about to set behind Mount Uetliberg (869m) this Monday morning. As you can see it turned out as planned. 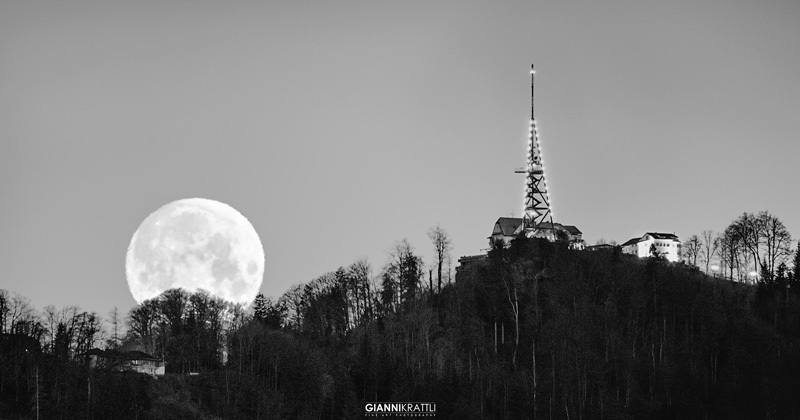 From Zollikon I was able to capture the Moon with the viewing tower on Mount Uetliberg from a distance of almost 6,5km. In the end the chase for the moon was more nerve-wracking as planned. When we drove down the Seestrasse we saw how the moon was coming closer and closer to the hilltop, a little earlier as we thought it would be. 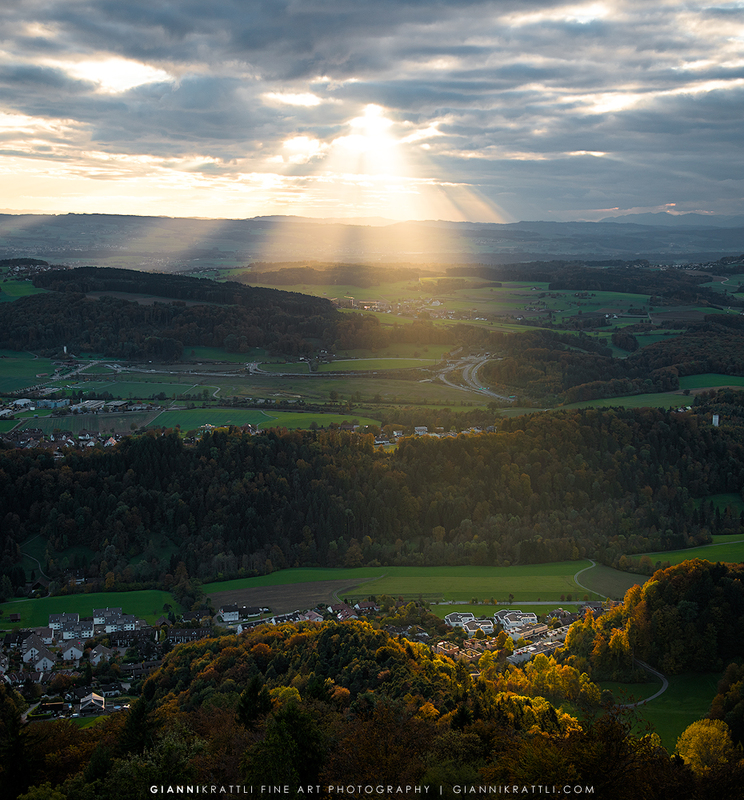 The last sunrays of the day are painting colored spots into the Knonauer Amt. Most of the days the Waid is offering wonderful views over the city and with luck even to the mountains. 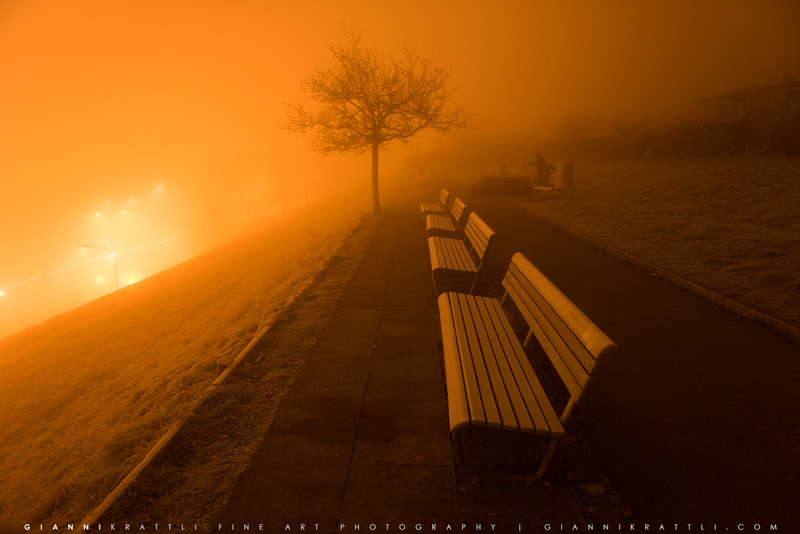 This image shows one of the morning when the view wasn’t that breathtaking.